Front row (left to right): 1. Jim Heiner, 2. Debbie Nethercott, 3. Richard Via, 4. P. Kruse, 5. L Bayles, 6. Billy Hunt, 7. J. Bugas, 8. J. Myers, 9. K. Gates, 10. Janie Floyd. Second row: 1. J. Ratcliffe, 2. David Simons, 3. R. Bothwell, 4. Ruth Kelley, 5. Jim Francis, 6. E. Heusinkveld, 7. Mike Judd, 8. K. DeGrazia, 9. Lynn Updike. Third row: 1. Gael Schafer, 2. L. Daily, 3. S. Simerman, 4. D. Hansen, 5. L. Canary, 6. S. Springer. Fourth row: 1. D. Cousatte, 2. D. Hannon, 3. Donna Herzog, 4. M. Button, 5. S. Lindsey, 6. Nina Ofiesh, 7. K. Colvin, 8. D. Powell, 9. J. Pane. Fifth row: 1. Jim Doggett, 2. D. Jenkins, 3. S. Hutchin, 4. J. Faurado, 5. Curt Grayson. Sixth row: 1. Stephanie Fullmer, 2. Kevin Duffus, 3. D. Benton, 4. J. Rock. Seventh row: 1. C. Bledsoe, 2. J. Essex, 3. Jeff Benton, 4. R. Lewis, 5. Rich Jacobson, 6. W. Walker, 7. T. Jenkins. Left to right: 1. Mike Judd, 2. Laurie Daily, 3. Jeanette Payne, 4. Debbie Cousatte, 5. Rich Via, 6. Debbie Hannon, 7. Teresa Hansen, 8. Debbie Nethercott, 9. Bob Schrader, 10. Ruth Kelly. Credits: Scanned from the 1974 yearbook by Kathy Blackwell. 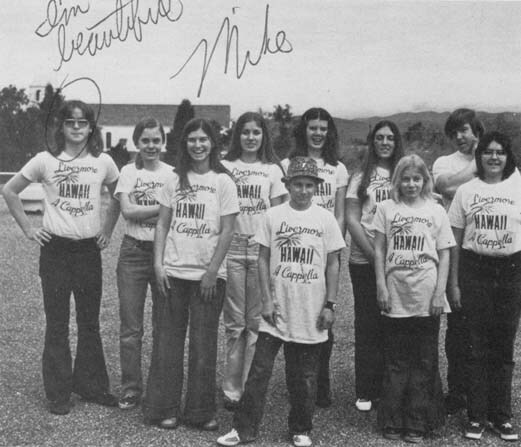 The kids in these pictures are members of the high school graduation classes of 1974, 1975, 1976, and 1977. 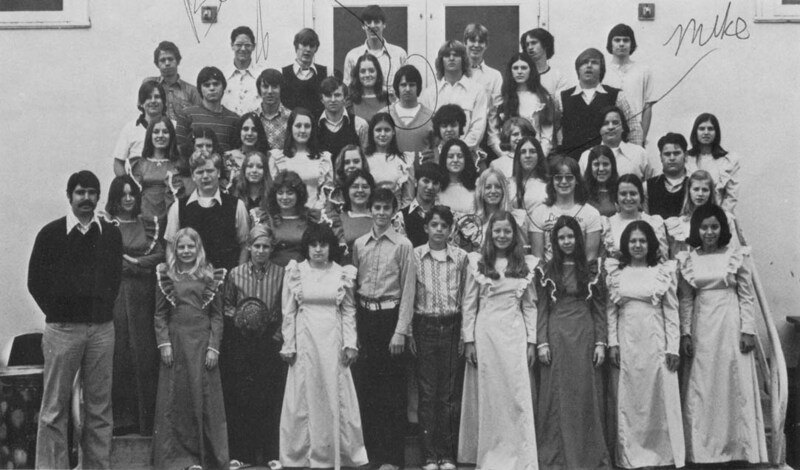 To find other pictures of these classes in the archive, see Livermore class pictures listed by year of high school graduation. And if you have any pictures from this era that you would like to share, please submit them to the Archive.